Tourism INDABA is an important opportunity for stakeholders in the sector to meet and discuss opportunities and common challenges at a policy level and it all kicked off at the INDABA Trade Floor opening, which took place on 7 May, Saturday at 9h20 in the auditorium of the Inkosi Albert Luthuli Convention Centre (Durban ICC). The opening was addressed by the Minister of Tourism, the Honourable Derek Hanekom , the Mayor of Durban, Mr James Nxumalo, and the MEC for KwaZulu-Natal Department of Economic Development, Tourism and Environmental Affairs, Mr Michael Mabuyakhulu. This was the second year that Minister Hanekom opened INDABA. The South African government has earmarked the sector as a growth industry of national priority because of its potential to bring about economic growth and create employment. The core mandate of the Department of Tourism is therefore to create conducive conditions for the sustainable growth and development of tourism in South Africa. During his opening address the Minister stated that by standing together the public and private sectors in the industry would be stronger and able to contribute to the upliftment of the nation. He spoke about INDABA and how it has evolved into Africa’s largest and most successful tourism trade show that creates a platform to showcase the best of the African tourism products and services. “Africa is vibrant melting pot for tourism: the diverse cultures, customs and traditions of our people, merged with the endless variety of our landscapes, blended with our unique biodiversity, tempered by our historical legacy, and fired by the spirit of freedom and equality, ” said Minister Hanekom. INDABA opens with 5938 number of meetings scheduled for Saturday only, 1047 exhibitors, 1856 buyers and 724 media. 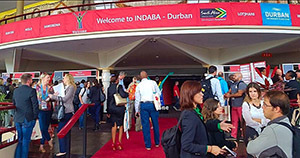 Owned by South African Tourism, INDABA is one of the largest tourism marketing events on the African calendar and showcases the widest variety of Africa’s best tourism products and services. The event attracts quality buyers from across South Africa, the African continent and the world.